JUST IN TIME FOR THE HOLIDAY SEASON! 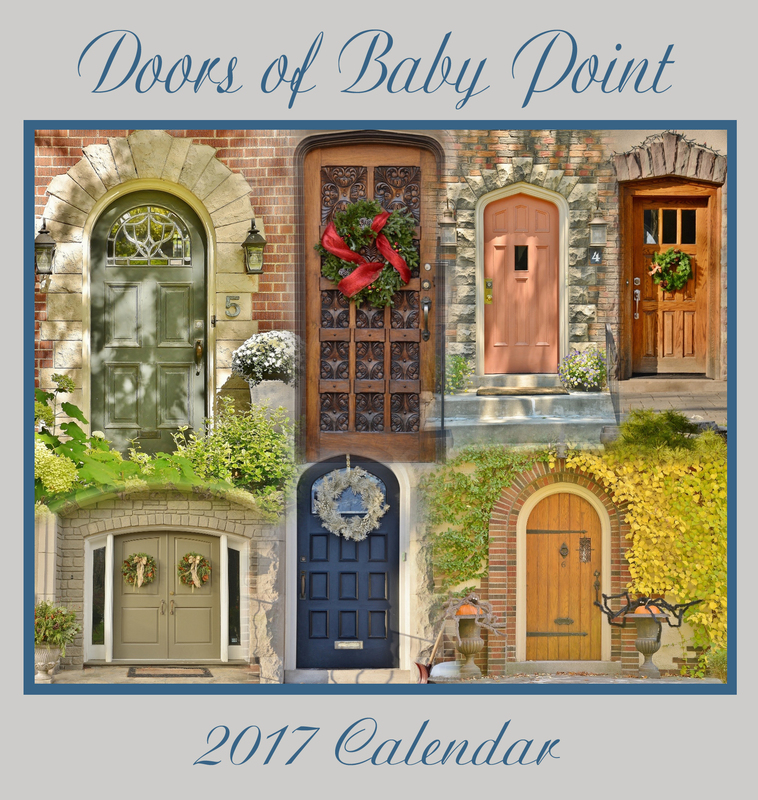 THE WINDOWS OF BABY POINT 2018 WALL CALENDAR – LIMITED EDITION, NOW AVAILABLE FOR PURCHASE! A UNIQUE, BEAUTIFUL, AND AFFORDABLE GIFT FOR FAMILY, FRIENDS AND COLLEAGUES. To purchase this product now, please go to our Store at “The Robert Home Smith Collection” product page on this website. 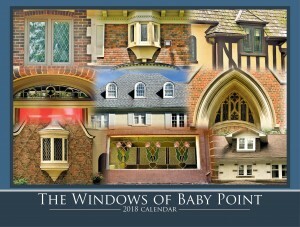 Thirteen beautiful images of The Windows of Baby Point are captured forever in this 2018 wall calendar. Featuring the windows of historic homes in the former City of York, and printed on silk stock, the calendar measures 12 x 9 inches. 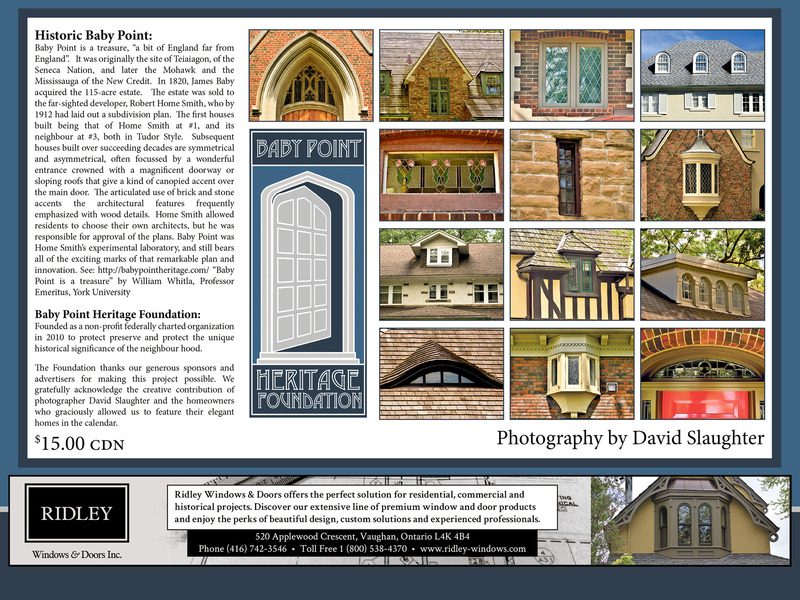 The Baby Point Heritage Foundation produced the calendar with the generous support of local advertisers and sponsors, the creative contributions of photographer David Slaughter, the Humbercrest United Church and twelve community homeowners who graciously allowed their elegant homes to be featured. 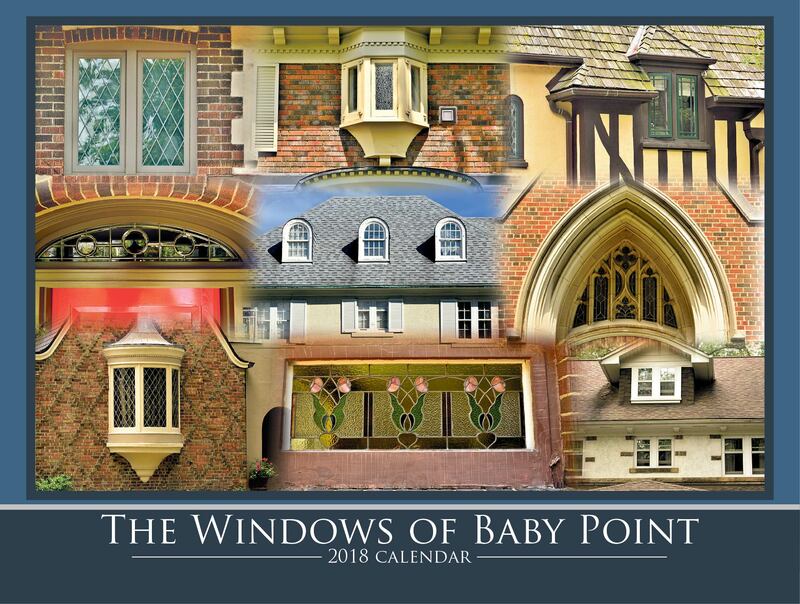 Priced at $15.00 The Windows of Baby Point 2018 Calendar is a great gift for those on your holiday gift list as well as for you and your family‎. It will be printed as a limited edition. October 2013. Led by its inaugural Chairperson, Dr. Robert D Galway, the BPHF published Baby Point: The Place Where We Live as its first fund-raising activity (co-authors PM Slaughter and RD Galway). Available in hard- and soft-cover, lavishly illustrated with archival material, maps and local photographs, the book was designed to educate and raise awareness of our neighbours to the unique community — historically, architecturally, archaeologically — in which we live.